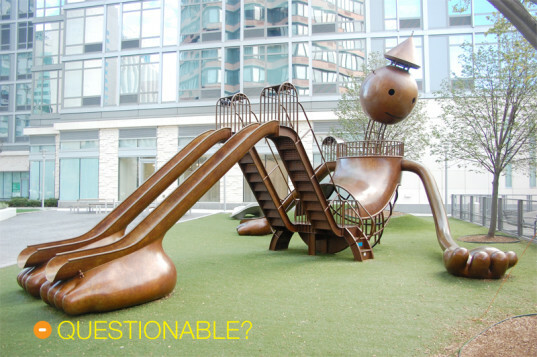 Playgrounds too safe? So concludes a recent article that’s been making the usual rounds on the Internet. The main contention is that the kiddie sites are becoming homogenized and dumbed down. “We’re now at a point where every playground is pretty much the same. And they’re boring. 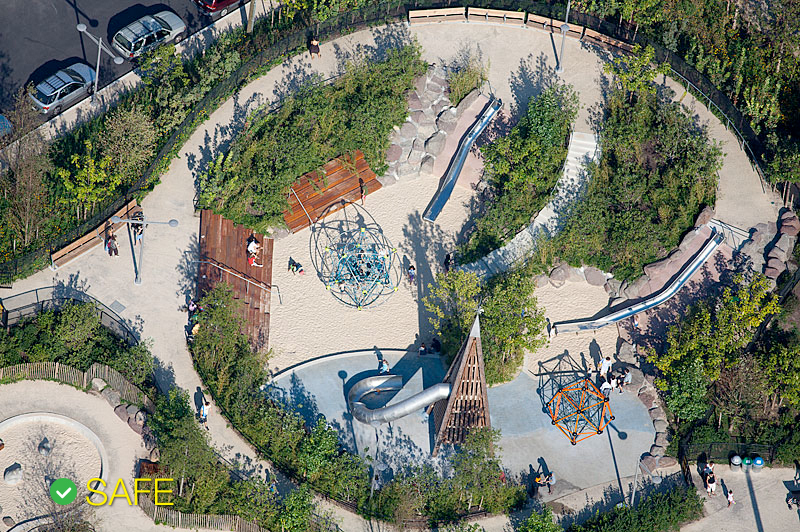 They’re not challenging,” says playground expert Alex Gilliam who longs for the 3-story forts of his youth. The talking points in the article say it all, with the author leading off by observing that “the increased focus on safety may have had unintended consequences: a generation of kids who aren’t able to accurately assess risk or cope with fear.” But even more interesting are the comments posted in reaction to the piece. But mostly it’s us parents who get the blame. We’re called wimpy, fraiddy-cat, sue-happy idiots. We’re “overprotective at every little cut.” And our kids will grow up to be “soft,” “clumsy,” “whiny little sissies.” Ouch. As a parent I’ve never liked playgrounds for my kid. Something about the confined space makes me uneasy. I fear not for my son, but for everyone else around him. He jumps from the top of the tall slide rather than zip down it, encourages kids to play ‘chicken fight’ on the monkey bars, and dismounts the tire swing like a pilot shooting out of his cockpit after pressing the emergency ‘eject’ button. It’s true that I get nervous watching him climb the two-story tall rope and steel geodesic dome at the Brooklyn Bridge Park Pier 6 playground, feeling a sense of relief when he makes it up and down safely. But at the same time, being the dad of a somewhat crazed risk-taker, who rarely gets hurt, a part of me sometimes wishes for more injuries … small ones. The type that teach lessons. We recently moved from the US to Australia with a 7 year old son. We have been amazed at the 'dangerous' playgrounds (in a good way, for the reasons outlined in this article) When posting pictures of him on some kind of dangerous high flying contraption, the responses from my American friends have been shock with comments like "there's no way you would find that in a US park, its a lawsuit waiting to happen" Its a shame, as you say here, its the kids that lose out in the end. Meanwhile, my son is happily taking risks here in Australia! this is really interesting. we live in germany, and right infront of our house there is an awesome playground that everybody here loves. i have heard comments from visting american friends though that the playground seems very dangerous, and that designs like that would not be allowed in the states. i wish for my children to become rockclimbers and treehouse-builders!! these are designs made by experts, and it's essential for children to take a few risks and try out something "daring". that's what all playgrounds should be about!!! Here in Brazil we have the same problem, everything must be "too" safe, so nowadays more and more kids are leaving the safe grounds of the playground to ride skates, rollerblades or anything that have more emotion with their parents. The playgrounds have become abandoned or exclusive for babies and toddlers. Playgrounds too safe? So concludes a recent article that�s been making the usual rounds on the Internet. The main contention is that the kiddie sites are becoming homogenized and dumbed down. �We're now at a point where every playground is pretty much the same. And they're boring. 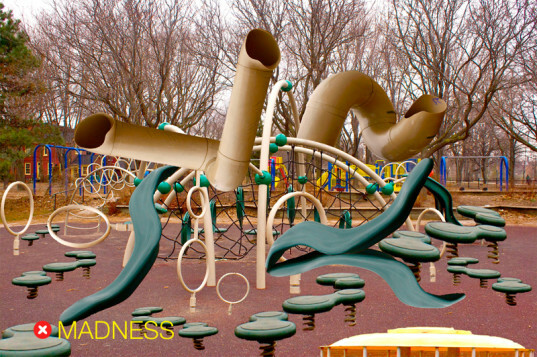 They're not challenging,� says playground expert Alex Gilliam who longs for the 3-story forts of his youth.